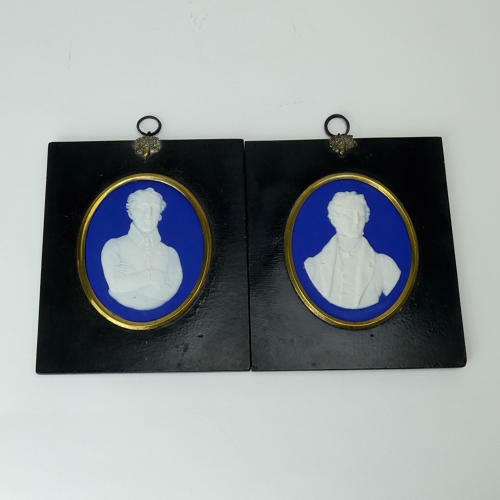 A fine pair of dark blue jasper dip portrait medallions. Each of these is marked 'WEDGWOOD', one is also impressed with an 'N' and the other with a 'V', and they date from c.1840. They depict Arthur Wellesley, the first Duke of Wellington and Sir Robert Peel. These two had political connections. Both were Prime Ministers in the first half of the 19th century. In 1828 Peel became leader of the House of Commons under Wellington and then in 1834 Wellington served as Foreign Secretary under Peel. These plaques have been together since they were first made. The plaque of Wellington was modelled from the portrait by H.P.Briggs in 1837 and the one of Peel is after the portrait by Sir Thomas Lawrence of 1826. Both plaques are very well modelled, with good detail, and the are in excellent condition. They are in their original frames, with brass mounts, which are typical of the period.